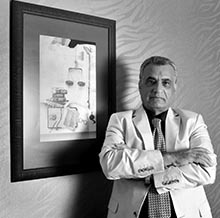 Attorney at Law Ahmet Ergün who is the founder of ERGUN & ERGUN Law Office was graduated from Istanbul University Law Faculty in 1971. He has a special interest in Criminal Law as well as he has experience and expertise in Obligations Law, Family Law, Property Law, Administration Law, Commercial Law, Labour Law. He speaks Arabic at advanced level.